I write this not to praise Tendulkar, but to denounce the hundred. 1. It has come in a game India lost. 2. It was the cause of the loss (he scored too slowly). 3. It took the focus away from the rest of the team on the game itself. 4. The year long drama waiting for this hundred has clearly affected the man and the team negatively. 5. It is no indicator of the form that he has been in of late (in Tests and ODIs). 6. The year long focus on the hundredth hundred has meant that we’ve not paid enough attention to the complete disarray the team is in right now. The disarray has happened in front of our eyes but very few eyes have been focused on the causes and solutions of the problem and far more have been obsessing over the hundredth hundred. 7. It is perhaps his most meaningless hundred (in both senses). It didn’t possess the boy-on-the-burning-deck grit of the 114 at Perth, the ferocious beauty (and utility) of the twin hundreds in Sharjah, the spine tingling relevance of the 100 at Chepauk post the Mumbai-terror-attack, the epic Greek-tragedy of the other Chennai hundred (and to a lesser extent the 175 in Hyderabad), the barrier breaking nature of the 200 or the sheer self-denial and strength of will that went into the 241 at Sydney. All of these hundreds mean something to me and most others. When we tell our long-suffering descendants (yet another) Sachin story, it will be one of these. Of the cuts and pulls on that Perth bunsen burner as boy barely taller than the stumps. 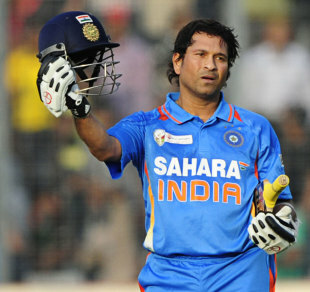 Of the many barriers of pain he walked through under that wrenching Chennai sun to hold up a faltering batting lineup. Of the elevation we all felt when, for two days in Sharjah, he was the most invincible batsman on the face of the planet. Of the tears we wept with him at the emotional release of that hundred after the terror attacks. As with all good devotees, I’m going to end up blaming the worshippers and not the deity. We expected too much. We wanted a sign. We wanted affirmation of our own beliefs. When they were not forthcoming, we raged, ranted and raved at the deity. At the end of it all, the deity’s just a man. Flesh, blood, bone and sinew. We refuse to believe that.